A few months back I made a post about a few of the binoculars I have been collecting, and mentioned I was thinking of picking up a pair of Celestron SkyMasters for some sky type viewing. (I never did get them). Shortly after the post was made I found a Mead Etx 60 Telescope at a thrift store for about 30$. I have not really tested its auto find functions yet as it was purchased in the middle of winter, but the other steering type functions do work though the remote. Right after I purchased it I printed up some instructions and dropped it off at my fathers house and asked him to figure out how to use it, (He's retired) and has some time on his hands. Then just last weekend I found this one for a similar cost that I'm pretty excited about. Its a Tasco 11TR. It came in the original packaging and looked to be in great condition. It could not have been used very much at all. After I brought it home I was happy to find all the parts were included and assembled it from its packaging. That same evening I took it out to the backyard and was pleasantly surprised with the views I was seeing, but it seemed a little stiff. The next morning I dis-assembled the mount and cleaned and re-lubed all the moving parts. For the last two days much of my spare time has been spent either reading or watching youtube videos on how I can best use this scope. At first there was a big learning curve and I had some trouble understanding a lot of what was said. Now I'm able to understand a little more of what I'm either watching or reading. To help get me started and understand some terminology better, I took some notes from various sources including this site. This is all the information I have so far compiled pertaining to this telescope and the eye pieces that were included. The notes I have taken can be seen below, and I'm also wondering if everything I collected is correct? One more question: Can any one tell me anything about the two F type eye pieces I have listed below? They must have been extra as they were not in the manuals part list. Note: Two more eye pieces came with the set, but they were duplicates in power and seemed to be of lesser quality. 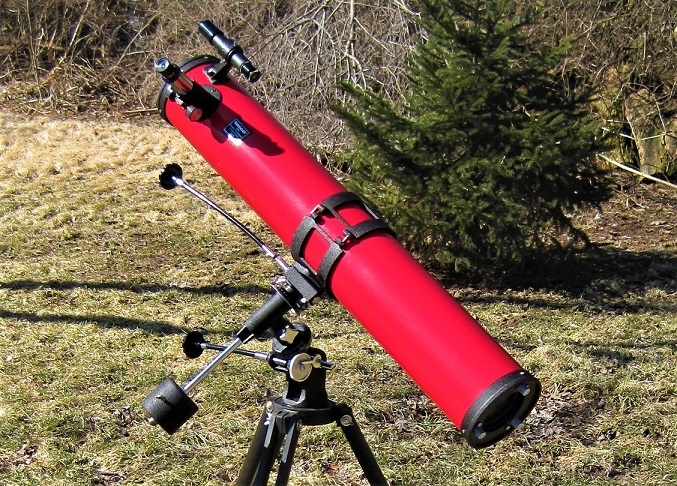 This Telescope Should Be Used Below 228.6X, Most people would Use a 9mm eyepiece that equates to 100X for comfortable max magnification in a “114.3 x 900” configuration. H= Means it is a hygens design (H=Hygens), simple design of 2 plano convex lens. The 2 lens are facing the same way. There are 3 or 4 eyepieces to be avoided that are fairly common. Ones to avoid include eyepieces with the following markings: H25mm, H20mm, H12.5mm and SR4mm. Eyepieces with H markings (Huygens optical configuration) are not of very good quality, the apparent fields of view are on the smaller side. Huygens eyepieces with smaller focal lengths tend to be worse than those with larger focal lengths. 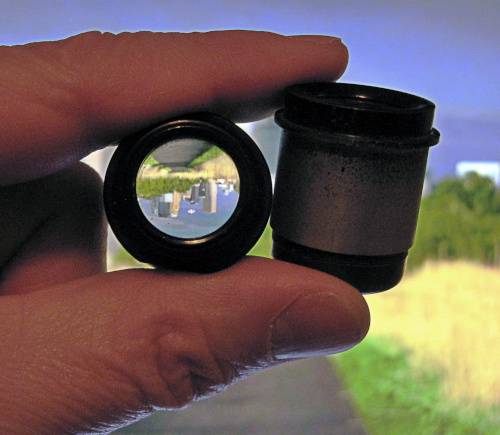 Most users that attempt to use an SR4mm eyepiece will also find it of little practical use. You basically need one eyepiece to produce a good low power magnification (in the range of 25x - 50x) and the other one should produce a good higher magnification (in the range of 90x - 120x). These magnifications will be the ones most commonly used in most any telescope. Edited by Mbinoc, 19 March 2019 - 08:58 PM. Next, you get to collimate it. That is where the fun begins. I just wanted to add, my father I have a place about a hour south in a farming community, We both live in various Chicago suburbs with lots of light polution, but this 2nd place is a little further out from the city and has noticeably better night views. He told me he always wanted to see the planets, and I thought this was something we could both enjoy together when we visit the other location together. I'm pretty new to this, and my experience with telescopes is limited. I'm hoping these two scopes will get us started. I'm thinking we could use the mead to help us find targets, and maybe then try to focus in on the same target with the larger scope. Edited by Mbinoc, 19 March 2019 - 09:08 PM. Do you have a computer? Down load a program called Stellarium. It's free and an excellent way to know what is up in the night sky. I have it setup in the back yard now, and have just been looking at the moon. In a direct comparison to my highest power binoculars (Celestion Nova J856 10x50), there is really no comparison at all in the detail I can see. On the Telescope tonight I am using the F12.5mm eye piece with a moon filter. For the $24.99 / Used purchase price, this pickup was a huge upgrade from what I had available before. Tonight's conditions are not the best, there is a noticeable haze in the sky, and with the bare eye I can only count about 17 stars. Though the binoculars I can see many more and also see several craters on the moon. 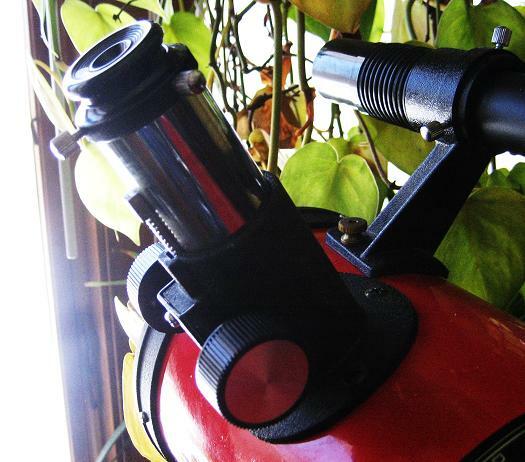 But this telescope is adding another dimension to everything that I see, and is allot more fun. Edited by Mbinoc, 19 March 2019 - 10:05 PM. I too developed an appreciation of my local thrift stores over the past few years. It's probably a good thing for me that the big one close to my workplace shut down last year, as my apartment was starting to look like the Lost Graveyard of the Telescopes... I would consider that one to be a nice find at that price. The info you have looks good to me. The main purpose of a 4mm Huygenian seems to be to give the scope distributor another magnification number to print on the box. No harm in trying it, but 225x is right at the limit of what any scope of that aperture can be expected to handle, its quality most likely will be meh, and you'll be jamming the tiny ocular into your eyeball. The lower-power Huygenians and Ramsdens work OK in a slow-ish scope like your f/8; the main cause of the disparagement that they tend to draw from the gurus here is that they have very narrow fields of view and cramped eye-relief compared to more advanced types (see this Wikipedia article). Use 'em if you got 'em. And, yeah, look into how to collimate the thing, too, which you probably already need to do, with a thrift-store Newt. Fortunately it's not terribly difficult with an f/8. Tip: Higher-quality .965s are kind of hard to come by nowadays, but watch your thrift stores for old broken binoculars, too. The eyepieces you rip out of them will often fit well enough into a .965" focuser (if you get lucky), and can give you pretty nice wider-field views for a pittance. In the last few days, I have been reading up on things quite a bit. I want to thank everyone who has replied. (Everything posted has been helpful). Before I purchase any new eye pieces, I have already been thinking of upgrading the focuser to a more common size. I have seen how other people have done it, and think its something I can probably handle. I see telescopes quite often in the thrift stores, and now that I have done some preliminary research on them I will have a little bit better idea of what to look for. Before last weekend I really had no clue at all. I think I will eventually either find a better one, or another with parts I might be able to use to upgrade this one. For now I'm just going to have fun with it, and be patient for another good deal to come along that might allow me to upgrade in-expensively. I'm just going to use it, and enjoy it. Maybe I will eventually try to clean the lenses, and research how to collimate. One thing I do want to do first is upgrade the finder scope, as its pretty much junk. Edited by Mbinoc, 19 March 2019 - 10:43 PM. That scope brings back memories. 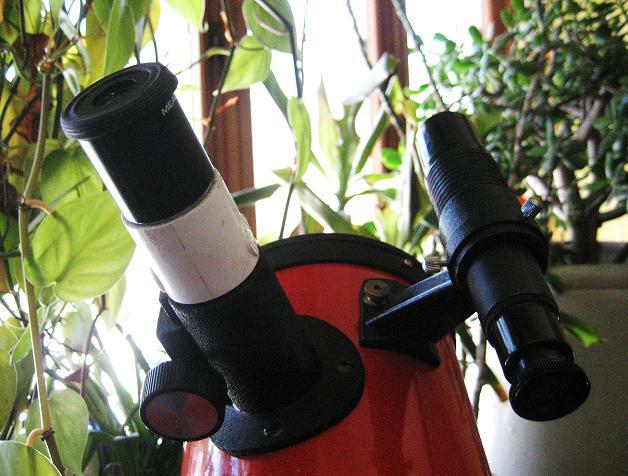 It was my first telescope after getting back into the hobby when I was 32, and I spent many, many fun nights under the stars before getting the aperture bug. A little additional investment will make it much more fun. Is the focuser 1.25" or .965"? Mine came with a .965", and I replaced it early on with a cheap 1.25 from Orion. Then I added a few inexpensive plossl eyepieces - Sirius 26mm from Orion, a Meade 3000 16mm, and maybe a 5mm? I can't remember, what I do remember is that Meade 16mm seemed to be an absolute sweet spot for that scope (and I still love that eyepiece in my other scopes). Is it a great scope? No, but I suspect you know that. But is it good enough to enjoy? Yes. So enjoy your scope until you get the aperture bug! "Harry / hboswell", like your past tasco telescope, It also has the smaller.965 Focuser and it came with these eye pieces. For some reason it also came with two additional Barlow lenses in addition to the ones listed above that are the larger 1.25" size, and can currently not be used with this scope. I think they might work with the mead since that did not come with any additional accessories. Also Included was a pretty neat vintage star chart that was made in 1963. It has a dial on it that you set the date and time, it then shows you what stars are in the sky on that particular night and time. The H20, and the two F12.5 eye pieces seem to work pretty well. I am keeping the included moon filter on one of the two f12.5 eye pieces, and these three eye pieces all seem to work fairly well. The two 4mm eye pieces I do not think I will be using, and I have not played with the barlow lenses or the erecting piece yet. So far I have been pretty happy with it, I guess "Since I have never looked through a nicer one, I do not know what I'm missing." "JoeInMN", Thanks for the binocular eyepiece info. I do not currently have any I want to tear apart, but if I ever find a inexpensive set that is not working I may give this a try. I also found a local club in the area that offers public viewing events, If I get into this more I may stop by one of these events to pic the members minds to help answer any questions I will have. Edited by Mbinoc, 21 March 2019 - 12:45 PM. 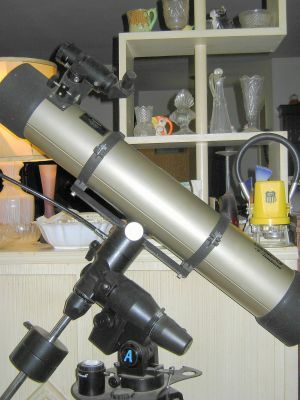 If anyone sees this post I have another question about the Mead ETX 60 AT telescope that I mentioned I also have. I used it today for some day time viewing just pointing out my window into the back yard. I temporarily mounted it to a fairly heavy duty Husky brand tripod that I have used in the past with some binoculars. 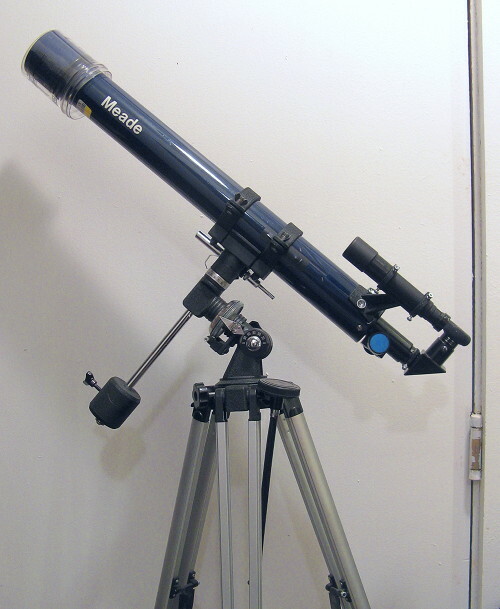 This Meade telescope has the two original eye pieces that came with it, (a Meade MA25 MM, and also a Meade MA9 MM). The question I have, is when looking into the backyard at a object through this Meade, (Up is Up, Down is Down, but Right is Left, and Left is Right). So the image appears backwards, but is right side up. Is this reverse of Left and Right something in the design of the internals of the scope, or is it in the design of the eye piece? I'm not sure how this reversal of the image works, and how it is able to maintain Up and Down, but not Left and Right. The reason I ask is for the last few years I have kept a vintage Bausch & Lomb 60mm spotting scope in a window pointing out into the backyard, and have been using it for bird watching, (Last year I got some nice views though it of a beautiful Snowy Owl that passed by, and stopped in my yard). 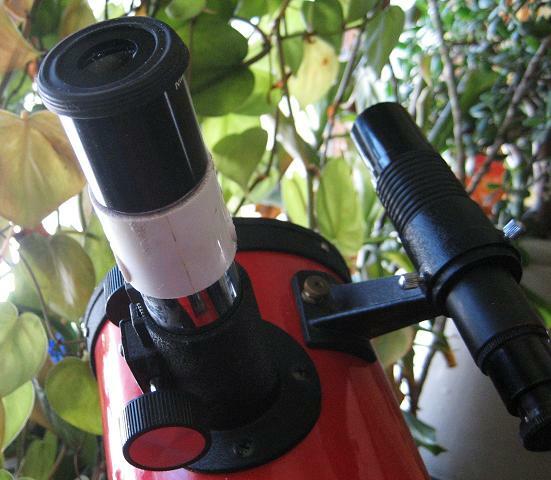 The Meade telescope gives a compatible view in clarity, but also a slightly wider view. If its just the eyepiece I was wondering if a different design of eyepiece could keep the correct up and down view, but reverse the left and right view back to normal? If So. I may keep this Meade setup in my window instead of the spotting scope. I also tried to download some star gazing apps on my phone, but was dis-appointed to find that my magnetic compass sensor is no longer working. So I'm going to have to figure out how to use charts. Edited by Mbinoc, 24 March 2019 - 07:00 PM. 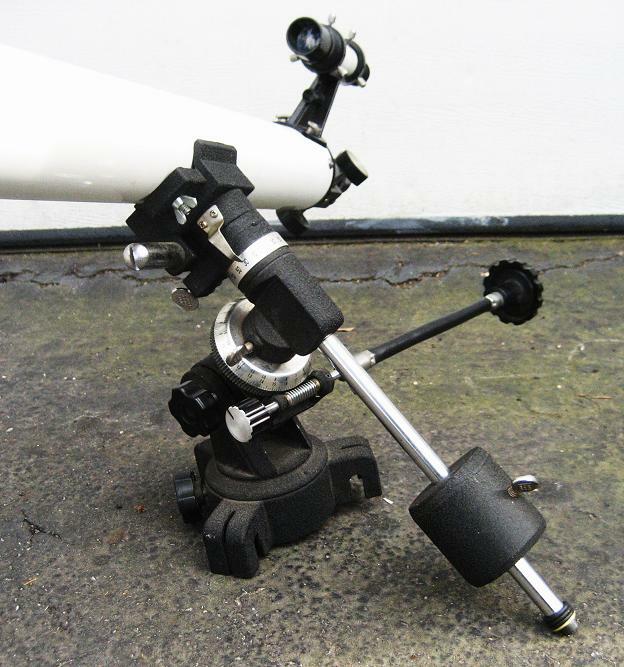 Telescopes designed for astronomy, used with an eyepiece alone, generally will produce an image which is correct but either upside-down (in a refractor or catadioptric) or rotated to a degree depending on the position of the focuser (in a Newtonian). Refractors and cats, however, are most often used with a star diagonal. This provides a more comfortable viewing angle, and many focusers won't have enough travel to reach focus without a diagonal. You've encountered the most obvious side effect of a diagonal, which is that it introduces an additional reflection and gives you a mirrored image. For astronomy, left and right don't matter so much. For daytime/terrestrial use, there are various types of erecting prisms that will give you an upright view. There are roof prism types, which are usually angled at either 45 or 90°, and the bulkier Porro prisms, which put the eyepiece in line with your target. They all require a bit more focus travel than a star diagonal, but most diagonal-using scopes probably can handle one or the other. These prisms are commonly available, either new from telescope distributors or through the CN Classifieds. Someone familiar with the ETX will have a better idea of what works with that. Erecting prisms generally aren't used for astronomy because the goal there is to eliminate unnecessary optical surfaces and reflections for the cleanest image possible. 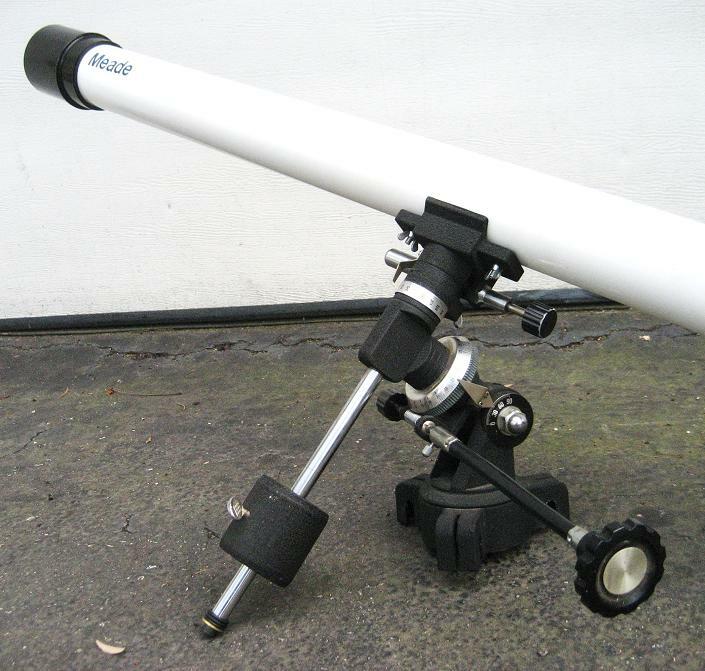 Edit: It looks like Meade makes a 45° erecting diagonal for the ETX-60; read the blurb for more info. Edited by JoeInMN, 25 March 2019 - 08:56 AM. Since I have made this first post, there has not yet been a good oportunity for me to try and search things out. Tonight is going to be overcast in the chicago burbs once again. So far I have just been able to observe the moon, I'm anxiously waiting for a good night to try and find my first planet. Once I do I will post my my experiance with both of these telescopes. I have never really realised how bad the light polution is in my area. In the last few weeks there has not been a single night I have been home that I can walk out into the back yard and see more than 20 or so stars with my bare eyes. Edited by Mbinoc, 05 April 2019 - 06:50 PM. Good idea on getting with the local club. Lots of good info there and probably opportunities for some hands-on evaluations too. I got a decently clear night with a cresent moon. I'm still unable to see anything with my bare eye from my backyard in the northern horizon, but there are more stars than I can count in the southern view. I have the tasco in the back yard just looking at the moon again. I'll maybe keep it out another hour or so before I go to bed and wait to see if I could at least find the north star. I wish the astrology apps worked on my phone, but since the sensor is not working I am out of luck. I'm not that great at identifying constellations yet. But I'm still managing to have some fun. I think my best bet is going to be the next time I out at the family cabin that is a hour and 15 minute drive south. Edited by Mbinoc, 08 April 2019 - 09:37 PM. Pull the inner ring from the Tasco and 1.25 eye pieces fit perfectly! I found that my $100 toy actually had amazing optics ! Thanks for the idea, On my telescope I found it did not fit just right, so I found a peice of PVC from a old drain pipe, cut it to size, and then borred out a portion of the inner tubing out on a spindle sander for a perfect snug fit. (Next I just need to clean it up a bit and paint it black). It literally took less than 10 minutes to make once I found a pipe size that would work for the modification. I would have never thought to do this on my own. Great Idea! I now have a few more eye peices to experiment with from the other telescope. With it in place, I do loose a little tad bit of travel downward, but for some things that may not be needed. Please Note: Standard PVC sizes will not work, This peice used was a chunk from a drain extention, and it also had to modified to fit as the inner diameter was too small to start with. Luckily I never toss them out, and keep all my extra unused portions in a drawer incase I ever need them. When you live in a house as old as mine, you never know what your going to need as some of the plumbing has been replaced with PVC, and some of it's drains are still the older metal style lines. Its always somewhat a pain to convert back and forth when a problem occurs. The next clear night I'm home I will have to test them out as the meade eye peices seem to be a little bit nicer than the tasco ones. Edited by Mbinoc, 15 April 2019 - 02:21 PM. 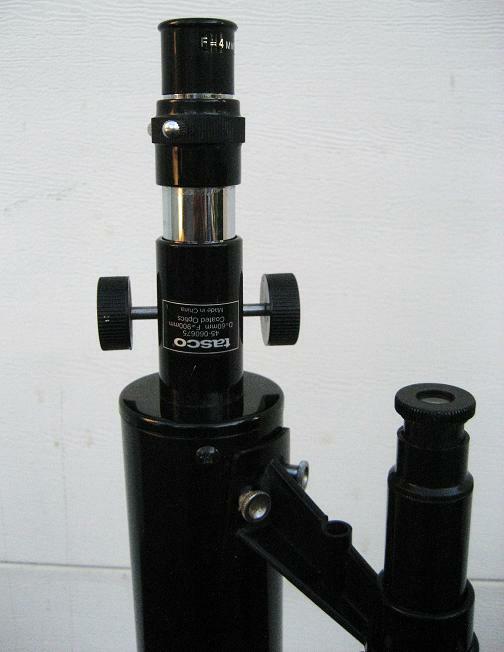 If you want some new eyepieces, Meade 4000 plossls are moderately priced. A liitle above, Vixen NPL plossls. If you think your optics can be improved, new asian spherical 114mm/900mm primaries are available, as are more expensive parabolic mirrors. High quality secondaries are available from US optical companies. I still have a Tasco Luminova 4.5in f/8 ota and a Meade 114NT/500 f/8 ota, with upgraded primaries. A 114mm/900mm newtonian can be a nice little all around scope. Edited by dmgriff, 16 April 2019 - 04:21 PM. Yesterday I picked up one more inexpensive one to add to the stable, its another Meade. I stopped by the local goodwill with a 20% coupon in hand. There were two telescopes there for sale. The other one was a reflector similar to my tasco I started this topic with so I left it for someone else to buy. The lenses were really dirty, so I cleaned them using some instructions I found on this site and found it to be pretty easy. I'm happy with the reults. Since the scope was so cheap. I wanted to try a lens cleaning on this one first before I open up my others just to get some experiance under my belt. My curiosity has been satisfied. I will eventually make some legs, and leave one of the three at a different location so I dont have to travel with them back and forth (I'm not sure which one will get the honor yet). I know this stuff I'm posting here is a big step down from what most of you have available and may not be all that desirable, but it has spiked my curiosity and is a nice educational start that I'm also finding interesting. So far I only have about 60$ invested into all three of them. And when the time comes to purchase a nicer one, I will be a more educated buyer to help fullfill my wants and needs. My next step in the evolution will probably be finding some nicer "Than I have" eye peices. Thanks again to everyone who has provided comments, and also to the others who have posted helpfull information I have read in other topics. Edited by Mbinoc, 17 April 2019 - 06:47 PM. My 60mm Meade 226 OTA rides on what looks like that exact same GEM, though mine has tube rings. The scope still proudly flaunts its $5.99 Goodwill price sticker. I don't remember how much the mount/tripod cost at Savers a year or so earlier; maybe twenty bucks? And it had a 60mm Bushnell scope on it, which I had little interest in, but I bought it for the mount. Is that Meade a 50mm? What model is it? Plastic or metal? From the pictures it looks to be in good shape. A big step down, pfftt... Depends on how you look at it. I see my own thrift store rescues in terms of sheer bang for the buck, and nobody's Takahashi can come close in that regard. 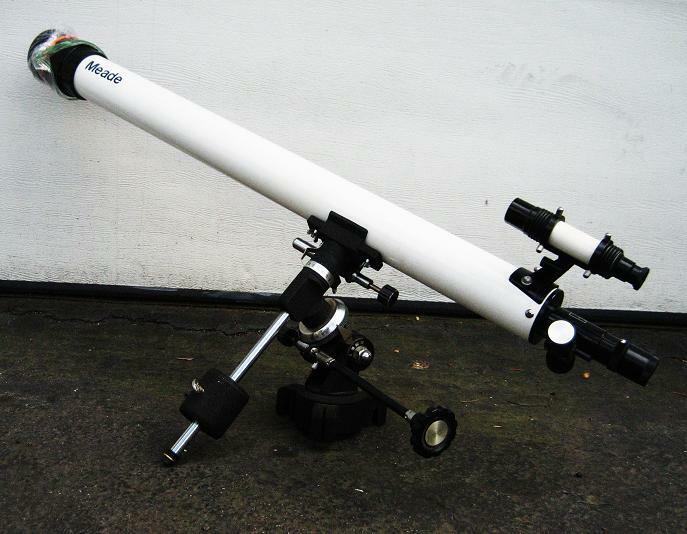 Its a 60mm x 900mm Meade 289 with a metal body, and plastic end peices. Its condition is decent and it has no dents, but a few small scratches here and there on the paint. The biggest issue was that it was stored without a eye peice or cap, and it looked like a spider took up residence making the inside lens pretty dirty. (the two internal lenses cleaned up well). 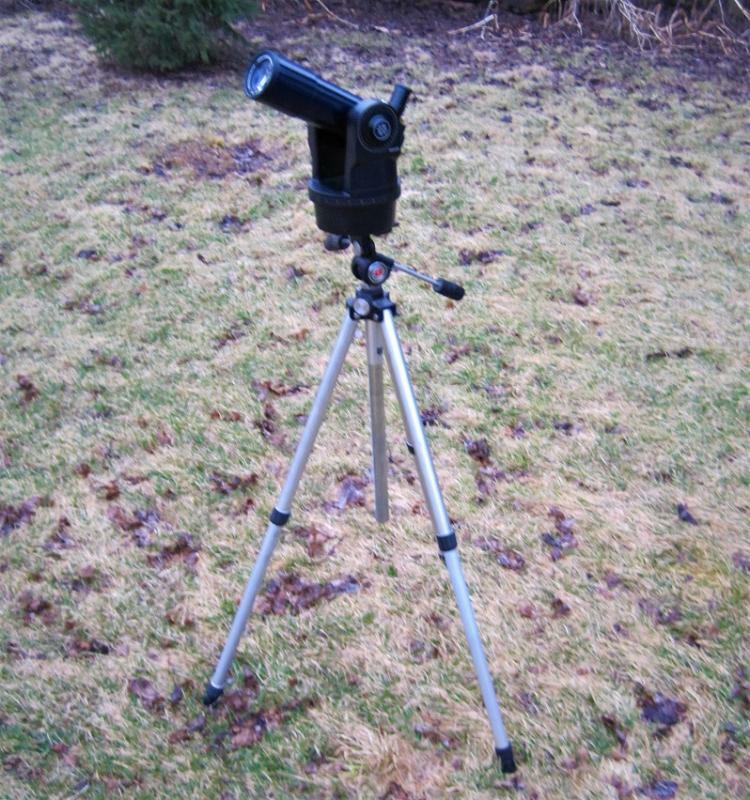 Before making a tripod for the Meade 289, I checked the local craigslist adds yesterday to see if I could maybe find a tripod for it, and I found a Tasco Galaxseee 302675 telescope just about a 5 minute drive away for a really good inexpensive price. 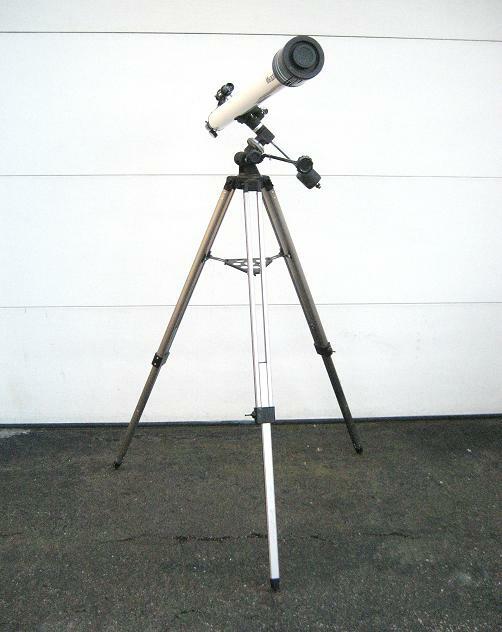 I purchased it just for the tripod, and now have its legs mounted to the Meade. After I got home last night I pulled out my air crompressor and did a quick sanding and respray of the Galaxseee and painted it black with some paint I allready had. (Its original paint was in poor condition with a few scratches, and the first owners dog chewed up the diagonal and eyepeices leading me to get it for a very good price, and all I really wanted it for was the tripod legs). This evening I just cleaned the lenses and re-assembled. My nephew has a birthday coming up, and I have decided that I'm going to give him either the Meade 289, or the Tasco Galaxseee 302675. Under first impresion, they are basically identicle, but after taking them apart I found the the Meade has thicker lenses, and the focuser although it's not great, it seems to be just a little nicer but not by much. 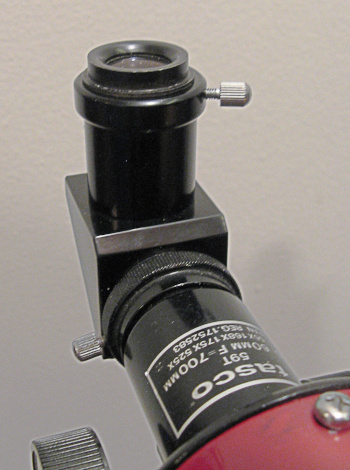 (The Meade's focuser has a metal extention, and the Tasco's looks like metal, but is chrome plastic). Here is the Meade on the new tripod. 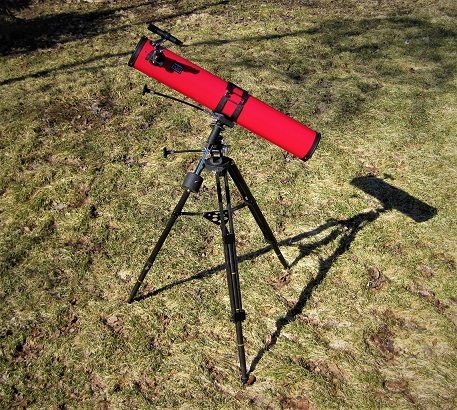 (I used the dew sheild from the Tasco, only because it has a dust cap, and my Meade was missing that part). All the parts on the two scopes are interchangable but just slightly different right down to the bolts, so I took the best from each to put on the Meade. 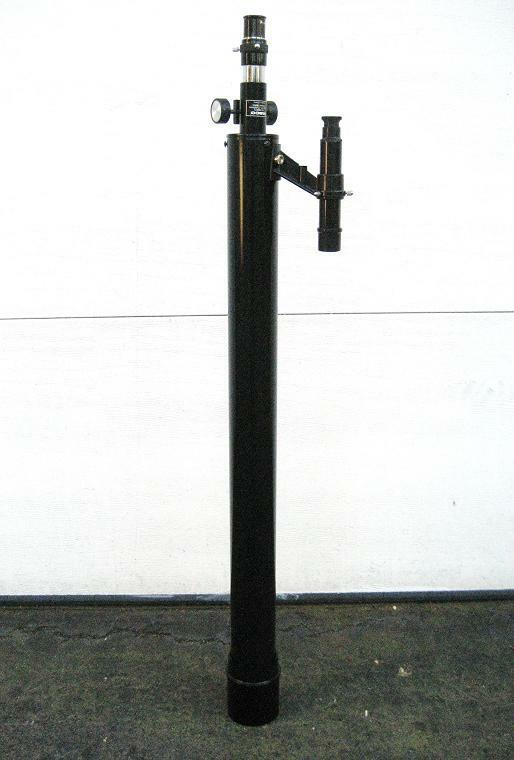 And here is the Tasco that I re-painted it yesterday turning it from blue to black, and I just assembled it today a few minutes ago. (I know I put the viewfinders mount is on backwards, after the photo was taken I reversed it back). I will still have to make a tripod for one of the two, but al least now the Meade is functional, and I also have a gift ready for my nephew's next birthday, (he lives just a few minutes away, so I could easily go over to his parents house in the evenings, and we could try to search things out together along with his grandfather). Those 4mm eye peices that came with my cheap telescopes are useless, so I'm using them as a dust sheild now that things have been cleaned up inside. I'm going to want to find a new diagonal before I give one of the two to my nephew. And once I buy some new eyepeices for myself, he will get a few of the ones I allready have now. My neighbor saw me setting up the telescope in the yard today before it got dark, and jokingly asked me If I'm a peeping tom...... lol. I was surprised he was actually knowledgable about telescopes, and we had a short discussion about them. Edited by Mbinoc, 20 April 2019 - 02:37 PM.